Kanyini is a captivating story told by Bob Randall, an Aboriginal man from Uluru (Ayers Rock) in Central Austalia. Bob Randall who is telling the story in Kanyini. Kanyini follows the typical story-telling pattern of Aboriginal people. We see Bob sitting in an armchair telling us about his life. Theses images are blended with contemporary and historical material showing Aboriginal life around the Aboriginal settlement at Mutitjulu (from the name of the permanent water source at Uluru). Bob takes us on a journey to not only discover Aboriginal culture, but also to discover the shocking pain white culture has imposed on his life and the life of all other Aboriginal people. Bob's soft voice and his matter-of-fact story-telling style are a stark contrast to what he is telling us. How he has suffered the loss of his "Kanyini", his belief-system, spirituality, his land and his family. You want to see this movie again. And you'll walk away with a confused feeling of pain, guilt, admiration and inspiration for action. I recommend you to get the DVD and show it to as many people as you can. The federal government has refused to support the film because it has been deemed 'negative'. "Kanyini" is a Pitjantjatjara word encompassing spirituality, community, land and family. 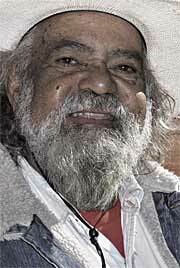 An anonymous reviewer wrote: "Several minutes into this film we meet Bob Randall, a charismatic Aboriginal song-man. His piercing eyes, beautiful voice and slow smooth delivery carefully dissect the average whitefella view of how Aboriginal people lost their way. Melanie Hogan and Bob Randall found archival footage of the Central Australian people at the time he was stolen from his family and taken more than 1000 miles away, and in the latter part of the film we see today the very place where he was sitting when the policeman grabbed him. The physical beauty, joy and health of those people are contrasted with the poor health and despair of those same folk today. The images of petrol sniffing are confronting in the extreme. These are not actors. Randall takes us on a journey explaining the four pillars that supported his life as a child - knowledge of living in the desert, living on one's own land, the support of family, and spirituality. Each is clearly explained through clever editing and intertwining archival footage. Then as he learns to exist in a white world and adopts its Christian philosophy, he asks why, against its own religion, settlers and government killed people and stole their land. There is no doubt left that the decimation of his people was wrong in every way. Strangely there is no hate in this movie. Randall' s delivery is matter-of-fact, breathtakingly crisp and honest. The power of this film is in its clarity and the authority of its delivery."